Let me start off by saying I am NOT crafty! I am not afraid to try but since I really have no patience the idea of spending 3 hours on a Pinterest project does not sound fun to me....just ask Dave about painting the entire inside of our house....NOT FUN! With that said, I decided to tackle a Halloween Wreath! I was pretty impressed with the Christmas Wreath I made last year so I decided to try again. I purchased all of my supplies at Michaels. Make sure to download their app. They have the best coupons! I saved 40% on one item and 20% off my entire purchase! 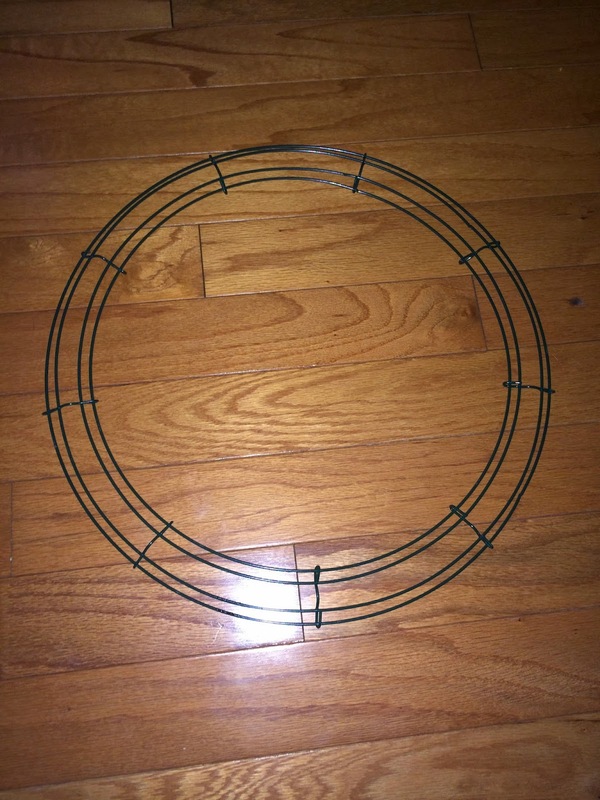 I purchased a wire wreath to wrap the mesh netting around. 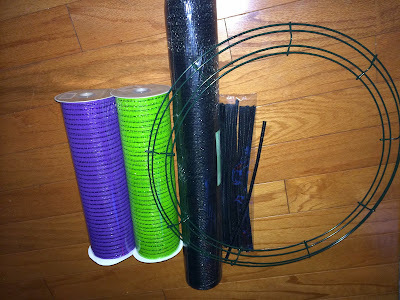 I used a large roll of black mesh netting and 2 small rolls of purple and green netting. I also purchased black pipe cleaners. 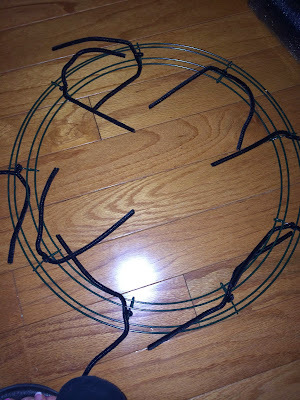 You need tie the pipe cleaners around the wire wreath. 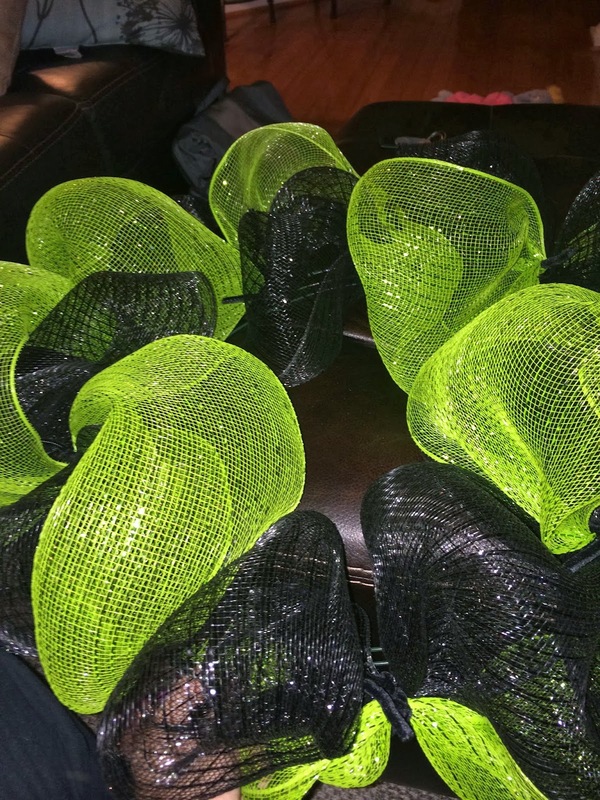 They will be used to secure the mesh netting. I used 8 pipe cleaners and tied them evenly around the wire wreath. After just the green and black mesh netting. You just have to play with the netting. I loop it to every pipe cleaner and tie. Since it is wire it is really easy to work with. 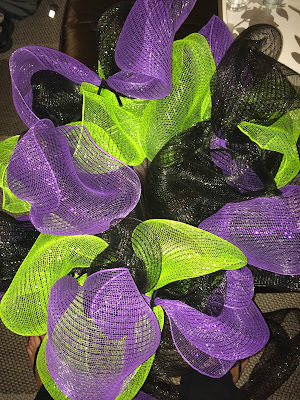 Wreath after adding the purple netting. Final! I bought the pre-made black and white ribbon, but if you are a skilled bow maker I am sure you can make your own. I also purchased all the accessories at Michaels. I just stuck them throughout the wreath. 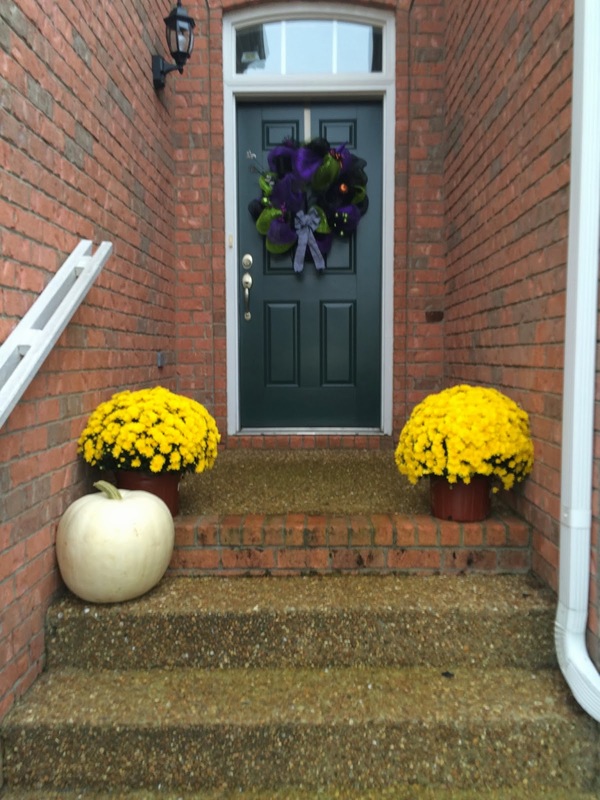 It took me about 30 minutes to make the wreath! 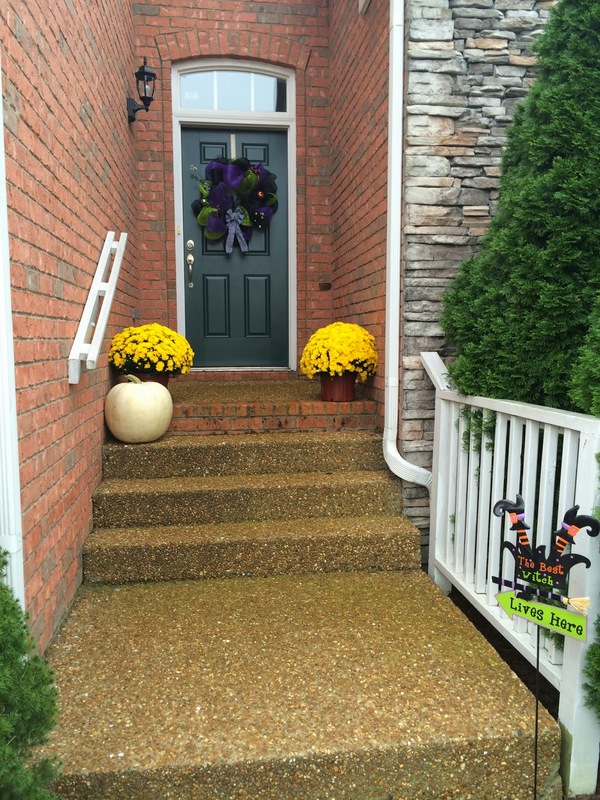 Ignore the front door AWFUL color...bit I do love my new witch sign! So I LOVE Shrimp and Grits....I don't eat them very much because they are horrible for you but they could be one of my favorite foods! 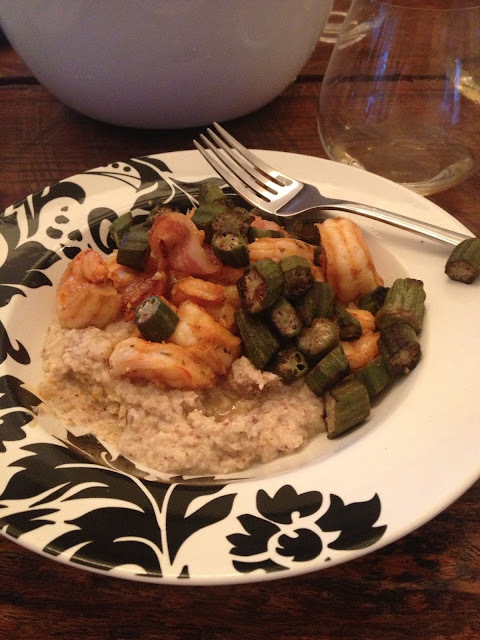 I was searching Pinterest last week for Paleo recipes and ran across one for Shrimp and Grits and thought I would try it! I had a back up meal because honestly I did NOT expect this to turn out! Also, my chef neighbor was coming for dinner who makes the best shrimp and grits I have ever eaten...no pressure at all! Now onto the recipe. I really actually took a lot from 3 different recipes so this one is mine! 1. Pour Shrimp into a bowl. Make sure it is defrosted and patted dry. Add salt, garlic powder, onion powder, Paprika, Cayenne Pepper, Oregano and Thyme. Make sure shrimp is evenly coated and set aside. 2. Add Olive oil or Coconut oil to pan over medium high heat. Saute onions for a few minutes or at least until they are starting to brown. Rice the Cauliflower in a food processor and add to the onions. After combining add chicken broth and bring to a boil. Stir in almond flour, garlic powder, salt and pepper. Cover and let simmer for 15 minutes. Check to see if you need to add more Almond Flour if your grits are too runny or more chicken broth if they are too thick. I used this exact recipe and they were perfect. Let cook another 5 minutes. 3. While the grits are simmering add bacon and okra to a pan and saute. 4. Add onion, garlic and Olive oil to a pan and saute for 3 minutes. Add seasoned shrimp. When the shrimp starts to turn pink, add lemon juice. 5. To serve, spoon grits into bowl and top with shrimp. Add okra and one strip of bacon to each place. I know it seems like a lot but it is so worth it and if the shrimp is defrosted it goes by so much faster!! What I Am Lovin' Wednesday! Well yes believe it or not I am still on the Paleo diet...I am down 3 pounds which is cool but what is even cooler is my stomach is flat....yes i said FLAT.....It has never been this flat! I was going to post pics but I thought after I am done I would post before and after pics...if there is that big of a difference. Anyway enough about how I can't have cookies :( I am lovin' all kinds of things this Wednesday! Kyoked with Eve! Who is Eve you ask? She is Carrie Underwood's trainer. She is UNREAL! 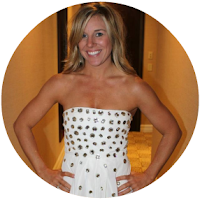 She is a trainer at Barry's Bootcamp and at Trace Morgan Fitness. She teaches a boxing class....with real bags and gloves...not YMCA air boxing! One can only hope my body will look like Carrie Underwood's..HAHA but I like to think it might! If you live in Nashville you HAVE to try her class!! 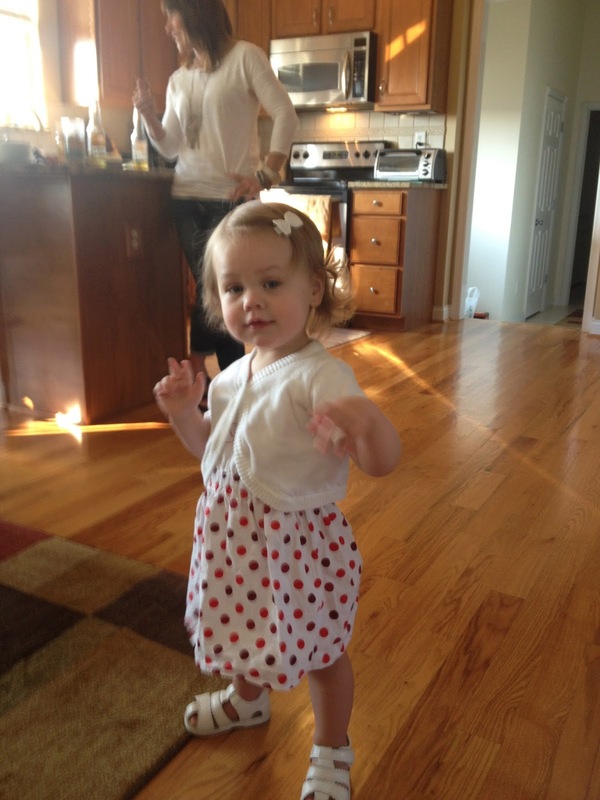 My beautiful cousin Elizabeth! I met her for the first time last weekend! 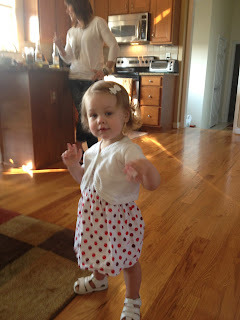 She is so so precious and so well behaved! I am also partial because we are related but she has amazing hair and lips to die for. I should already start her a lipstick collection!! So I feel like one of the only ways I am going to be accountable for this is to blog about it! I am going to do a 60 day "eating healthy" food challenge. It is not a diet, but more a way to stop my cravings for cookies, wine and french fries. The good news: I work out a lot! I also don't like to lose. I try to run faster than anyone in class, lift heavier weights, do more sit-ups, etc. I am competitive and it isn't a bad thing...It helps me push myself to new levels. I was never able to run a mile in under 7 minutes, even when I played soccer in high school but I can do that now. 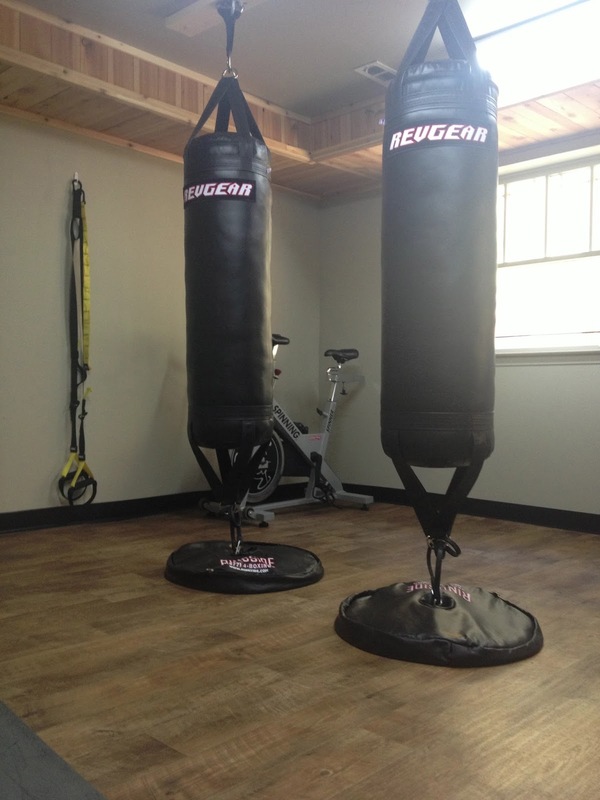 So being competitive pushed me to a new level of fitness. Now for the bad news, my food intake. I don't eat that unhealthy but when I slip, I can't seem to get back on track. A typical day for me includes greek yogurt or a protein shake for breakfast, a lean cuisine or salad for lunch and turkey spaghetti or turkey tacos for dinner. There is not a day that goes by that I do not have chocolate. I LOVE COOKIES! I could be the "cookie monster"! It has gotten to where I feel a need for dessert after lunch and dinner. I have reached a plateau to where no matter how many times a week or how hard I work out I am just not loosing weight or seeing any definition. I am not fat and I know that. I will never be a size 2 and have small legs. Some things you just cannot change. I am blessed to have a muscular physique (thanks mom) and be evenly proportioned, however I won't be able to work out like I do forever and I know that. I have been getting stress headaches a lot lately which triggered me to research why I was getting them. One of the causes was an unhealthy diet. Dave and I both celebrated our birthdays this month and have been out of town a few times lately which means our healthy eating regime went completely out the window. One day Dave and I would like to have children and I want to be in the best possible shape and health when that does happen. So what is the "healthy eating" plan I am talking about? It is a book titled "It Starts With Food". I read it this weekend while we were camping. Basically it is a paleo diet which simply means meat, veggies, fruits and healthy fats. I cannot have dairy, sugar or carbs for 60 days. Sadly, that includes wine and cookies. Yes, I may need your prayers. I am not sure I can even remember a week let alone 2 months without cookies. I keep telling myself that this is a good thing, I am not completely convinced yet. I hope to have a couple of abs after my no cookie diet. I took a before photo that I will share with you this week. Hopefully by adding this meal plan with my normal workouts I will have no more headaches and will see some definition in my stomach that as of now never gets leaner. Thank goodness for Pinterest! I found so many awesome recipes today. My biggest issue is going to be breakfast. I workout in the mornings and get ready at the gym to go to work. I don't have the luxury at the office to cook up scrambled eggs. I found a recipe for "egg muffins" that I can make ahead of time and stick in the microwave at work. Preheat oven to 350. Spray Muffin pan with olive oil. Whisk together eggs and add salt and pepper. Add steamed broccoli and turkey sausage. Pour into muffin tin. Bake for 20-25 minutes or until fork comes out clean and eggs are fluffy. *You can mix it up a bit by adding spinach, mushrooms, tomatoes, bacon, etc. You can even add cheese if you aren't trying out Paleo. For my first day of this new way of eating I packed the egg muffins for breakfast with a few fresh strawberries and blackberries. Lunch is a paleo chicken salad (made this with shredded chicken, walnuts, grapes, celery and paleo mayo), peach, lettuce with tomatoes and cucumber and almonds. I am going to be tested for dinner tomorrow night since we are going out for my sweet friend, Macy's birthday. I am going to have to say no to margarita and chips and salsa. I hope I can hold onto my willpower!! I think if I order fajitas and just eat the meat and veggies I should be ok!